The Chairman of Dangerzone and CEO of T.W.O. Entertainment, Paramecium came out to the ring. He began by welcoming all to the 100th and final installment of Dangerzone. Paramecium then asked his rival Scott Thunder to come out to the ring. Paramecium reminded everyone that next week, at the T.W.O. 's final event Extravaganza 5, Paramecium's Dangerzone brand and Scott Thunder's ICON TV brand would compete in an interpromotional contest unlike anything we've ever seen. Then in the main event of main events, Paramecium will challenge Scott Thunder for the World Heavyweight Championship in a best 2 of 3 falls match to decide once and for all the winner of their 7 year feud. A feud which started at the T.W.O. 's first event in 1997 and is guaranteed to end at Extravaganza 5!!! "But what did you call me out here for?" Thunder asked. "Because I've decided that you and I will be in competition tonight." "Our match has already been scheduled for Extravaganza 5! We can't do it tonight!" "Not that match you idiot! A tag team match. You and I started the tag team division in 1998. In the past we've ruled as the best team in the T.W.O. And even though we haven't always seen eye-to-eye, I would hate for us to miss out on our final opportunity to gain revenge on those red-necks that cost us the belts." "But the Board of Commissioners decided that we couldn't get a re-match." "Yes but I defeated Mr. Malicious at Dangerzone 96, taking back control of my company. Therefore, I have the final say. That is why I say tonight, you (Scott Thunder) and I (Paramecium) will step in the ring one last time - as partners - to challenge The Trash Wrassla's for the T.W.O. Tag Team Championships!" At Dangerzone 99, Narc eliminated Enforcer from the Battle Royal. Tonight they competed for Narc's Jobber Championship. After pinning Narc, Wrestling Enforcer thought he was in the clear. Instead he was attacked by P.A.B. Obviously still peeved about being pulled over at Payback 3. Hades & Raging Randy asked Stratus if he would consider joining "Team ICON TV" tonight to face "Team Dangerzone." At first Stratus was hesitant, "I haven't forgotten what happened the last time I was in a team with you guys." But they insisted that he meet the other members of the team. Sinsyde & Korpral. Stratus thought about the proposal for a moment and then decided, "let's destroy Dangerzone tonight, once and for all." For winning the Lightheavyweight Battle Royal (Dangerzone 99) Dellico received a shot at the Lightheavyweight Title. Dellico and Chris have had a storied history, and they stepped in the ring one last time at Dangerzone 100! Like before, The Cunning One came out victorious. Lazaroth walked through the backstage studying various members of the Dangerzone brand. "I want you, you, you and you." Within seconds, Lazaroth had made his demands and his team was formed - Lazaroth, Lestat, Kamikaze, Zombie and Rain. After several minutes of action, ICON TV wrestlers Natas & Blaze came to ringside. At first it seemed as though Spaz & Arachnid would work together to battle the rival brand. Instead, Spaz took the opportunity to attack and pin Arachnid. After Spaz left the ring, Natas & Blaze doubleteamed Arachnid. They said that Arachnid's beating was but a sample of what would happen to the Dangerzone roster at Extravaganza 5. Acronym members P.A.B. & (Dellico) D.M.S. were disappointed about their loss last week at ICON TV 5 and Dellico's failure to recapture the Lightheavyweight Championship earlier tonight. But they were not going to allow those losses to spoil the party as they celebrated the Acronym's great run over the past several years. Suddenly, Law & Order crashed the party. Wrestling Enforcer and Wrestling Re-Enforcer were peeved about P.A.B. 's sneak attack earlier and they were ready to brawl. The Acronyms took them on in an impromptu backstage match and proceeded to pummel them until officials pulled them apart. "If you are man enough to settle this one-on-one," P.A.B. yelled, "let's do it in the ring at Extravaganza 5. If you promise not to allow your partner to interfere, then I promise Dellico will not interfere either. And just to make things interesting, I'll bring the ceiling tiles and you bring the handcuffs. We'll have the world's first ever Ceiling Tile/Restraint Match at Extravaganza 5!!!" Enforcer agreed to the match as he was pulled from the dressing room. In the T.W.O. 's final Women's Championship Match, former Champ Jade challenged current Champ Missy Maniac. It was as good a match as any we've seen and Missy once again proved that she is the best female wrestler in the history of the T.W.O. as she retired the belt with a more than 1 year reign. 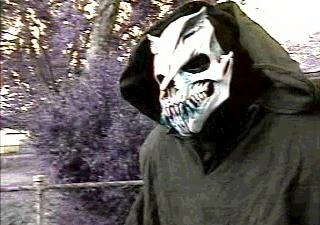 Today's guest on The Exclusive was none-other-than the mysterious Druid. Because the Druid rarely talks, this "Exclusive" was already going to be something special, but when it was announced that The Druid would unmask, the fans gasped in awe. The Druid walked out to the ring and screamed, "behold, the Druid's true form!" He then pulled back his hood and revealed... the face of death! T.W.O. Interviewer (Novice) attempted to start the interview but was abruptly interrupted by the entrance of Cadavor. Cadavor came to the ring and demanded that The Druid pay for his sins, "you cost me my last shot at the World Title and for that you will pay!!!" "Last week (Dangerzone 99) you cost me a match too," Druid replied, "Now we're even." As officials carefully escorted both men to the back, another Superstar came out to the ring. Spaz announced that even though much time had passed since our last PPV (Payback 3) he was still unhappy with the way Novice cost him his chance at the Tag Team Championships. Spaz then challenged Novice to a match at Extravaganza 5. Arachnid found the dressing room of Natas & Blaze and kicked the door in. "Where are you f----ts?" Nobody answered. So Arachnid trashed the entire dressing room. Suddenly, Natas & Blaze sprung from behind the door. They sprayed mace in Arachnid's eyes and proceeded to doubleteam him for the second time tonight. As officials heard the commotion, they rushed the room and pulled the men apart. "I'm sick of this double-teaming chicken s--t! If you've got the b---s, face me in the ring at Extravaganza 5! Then I'll take both of you on and I dare you to try doubleteaming me when I can see you coming." The Trash Wrassla's have defended the belts against all challengers. Tonight, they defended the belts against the former Champs Thunder & Paramecium. After dethroning the red-neck Champs, Thunder and Paramecium proved that are still the best team in the history of the T.W.O. They started the division as Champs and they finished the division as Champs. As 'Cunning' Chris proudly walked through the hall, holding his coveted Lightheavyweight Championship, he was approached by Women's Champion Missy Maniac. Missy: It feels good to be the Champ doesn't it. Missy: And how long have you held that belt now? Chris: As long as you've held the Women's Title. Since Extravaganza 4. Missy: And just think. In the past year and a half, you've defeated every Lightheavyweight contender in the T.W.O. and I've defeated every female in the T.W.O. Chris: You're right. I never realized that we were in such a similar situation. Missy: Say, wouldn't it be a great match if you could defend your belt against somebody you've never faced before? Chris: That's impossible. Like you said, I've defeated everyone in the division. Missy: Maybe officially. But technically there's someone who qualifies as a Lightheavyweight who's never challenged you for the belt. Missy: Yes me, silly. Wouldn't that be a great match. The best Lightheavyweight Champion ever vs. the best Women's Champion ever? Missy: What's the matter? Afraid you might lose to a girl? Missy: Then it's settled. You and me at Extravaganza 5. Enjoy the belt. This may be your last week as Champion. Zombie, Lestat, Lazaroth, Kamikaze, Rain vs. So Lestat & Kamikaze eliminated Stratus. Hades & Sinsyde eliminated Kamikaze. Hades & Lazaroth eliminated Lestat. So it was down to former Dominion partners Lazaroth & Hades. The fans were on their feet as they cheered for their favorite brand. It looked as though the confrontation between Lazaroth and Hades would decide which brand's team was better, unfortunately this did not happen. All the men who were eliminated, returned to the ring along with several other Superstars and a brawl ensued that was bigger than any other fight we have ever seen. Almost bigger than the Iraq war! But not as one-sided. The officials could not contain the action, as wrestlers spilled out into the crowd and even over the fence into adjacent yards. Then with the sound of his voice, everyone froze. Paramecium had come out from the back and standing next to him was his Tag Team Championship partner and bitter rival Scott Thunder. The wrestlers were so excited about Extravaganza 5 that they forgot they were fighting and T.W.O. officials were able to chorale them all backstage. As they were heading backstage, Paramecium turned to Thunder and said, "I'll see you at Extravaganza 5. May the best brand win!" May the Best Brand Win!